You can (and should) always learn from those who come before you. 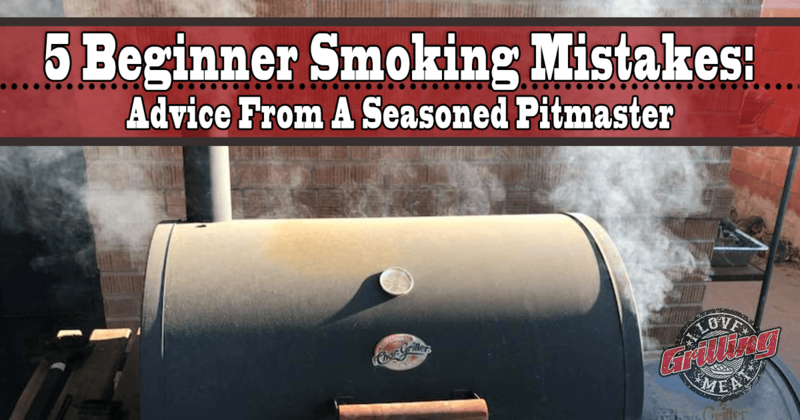 Here are 5 beginner smoking mistakes and how to avoid them, from a Pitmaster with a mountain of experience. …and by “branching out” , Pitmaster Ry means trying your hand at different kinds of equipment and different techniques. Maybe when you got started, you found a setup that’s easy to operate. Are you still using that same setup? Don’t be afraid to keep learning. Beginner smokers are great for, as their name suggests, learning the basics. Once you have those down, feel free to upgrade your gear. This might seem scary, but the world of flavors and techniques that lies ahead is definitely worth it. You probably have a lot of spices in your kitchen (if we might guess, more than a dozen). When you get started with grilling or smoking meat, you will be tempted to use them all, probably even at the same time! More spice means more flavor, right? Well, not exactly. In most cases, salt and pepper is all you really need to bring out the flavor that’s already in the meat. If you drown a steak in spices, you will lose that! Instead, start small – salt and pepper – and go from there. Try adding one spice at a time, and see what works with what. This will help you get a feel for what is needed as well as what you like personally, which is after all why we smoke meat! There are smokers that can hold 8 racks of ribs without a sweat. If you just got your first smoker, this is probably not the case. When you place too much meat in a smoker, you compromise on a number of things. For one, more cold meat in the chamber means the heat will be harder to handle, and cooking times will definitely be longer. You might also discover that the amount of smoke you are generating is not enough for all of it. Take the time to learn what the limits of your cooker are. One of the beginner smoking mistakes many young pitmasters make, is not allowing the smoke to work its magic. Opening the lid too often leads to fluctuating temperatures, especially on longer cooks like briskets. Know that many of the great results you can get from smoking meat, are because you let things happen. Don’t cook with a clock – if you read that a pork but should be ready in 6 hours, and you take it off at 6 hours sharp, you may be serving an underdone piece of meat. Instead, cook by temperature and tenderness. Know what the target internal temperature is for the specific cut you are cooking, and check if the meat is as tender as you would like. Yes, you read that right. There is such a thing as taking things too seriously. If you catch yourself stressing about cooking times, ingredients, what someone said about your food, et cetera – you’re doing it WRONG. Smoking meat in your back yard is supposed to be fun. Whether it’s with friends, family, or by yourself, remember that you have nothing to prove. Crack open a cold one, and enjoy the process. Like Pitmaster Ry says, it’s like “Smoking Therapy”.